A flowchart is a visual diagram used to describe an algorithm. 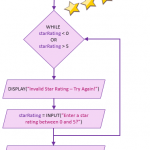 It enables you to describe the key steps of your algorithms and highlights when the user will be required to input data, when the computer will output/display information to the end-user, when a decision block (Selection / IF Statement) or a loop (Iteration) is used. Diamond shapes to represent an IF Statement (Selection) or a LOOP (iteration). 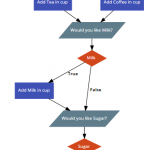 Try our new online flowchart creator to design your own algorithms.